Authentic but basic Thai chicken curry in 25 minutes. 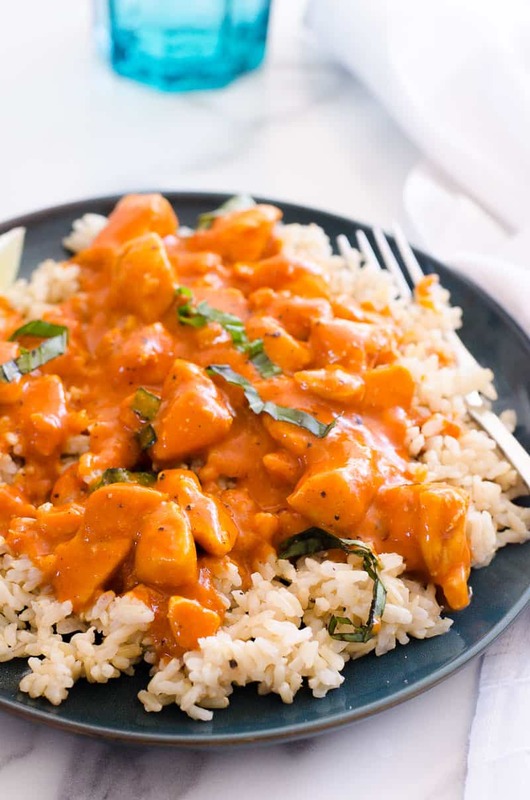 I have eaten a fair share of curries at Canadian restaurants and I can assure you don’t have to leave the house to enjoy a good curry served over the most perfect Instant Pot brown rice. This silky smooth Thai coconut chicken curry with warm spices and a bit of a kick is so simple to make at home. 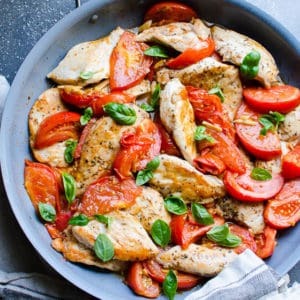 And healthy with a taste of most indulgent comfort food! All my 3 boys raved about it for days! Not all canned coconut milk is the same. Trust me! The biggest challenge is not smooth with small lumps coconut milk. Full fat and not low fat (diluted with water) coconut milk. Healthy fats are good for us (Harvard University). Not from cheap brands found in Asian section (sorry!). They contain a lot of preservatives and chemicals. Smooth creamy consistency without small lumps. In BPA free cans and organic are a bonus. From brands that I tried and like are 365, Thai kitchen, Trader Joe’s and Compliments. Tip: It is normal to see cream on top and liquid on a bottom when you open the can during colder months. Add everything to the pan and coconut milk will melt. Kaffir lime leaves are a specialty item from Asian supermarket. 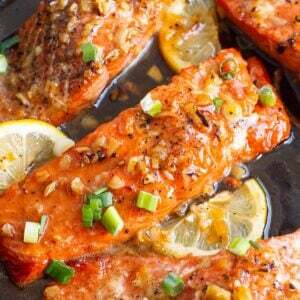 They add citrus flavor and sweetness. But you don’t need them and can easily replace with fresh basil at the end. 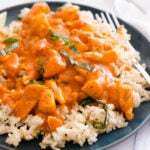 And even if you don’t have basil, you can still make this OMG good Thai red chicken curry. And I skipped fresh lemongrass on purpose. To see if curry turns out tasty. And it did! If I never have it on hand, neither do you. But you can add it with garlic and ginger, if you are familiar how to bruise and chop it. It is a nice bonus. How Much and Which Curry Paste? A million $ question. How much? 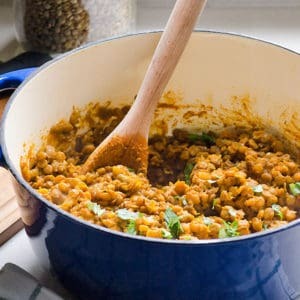 Very mild curry – 1 tbsp. 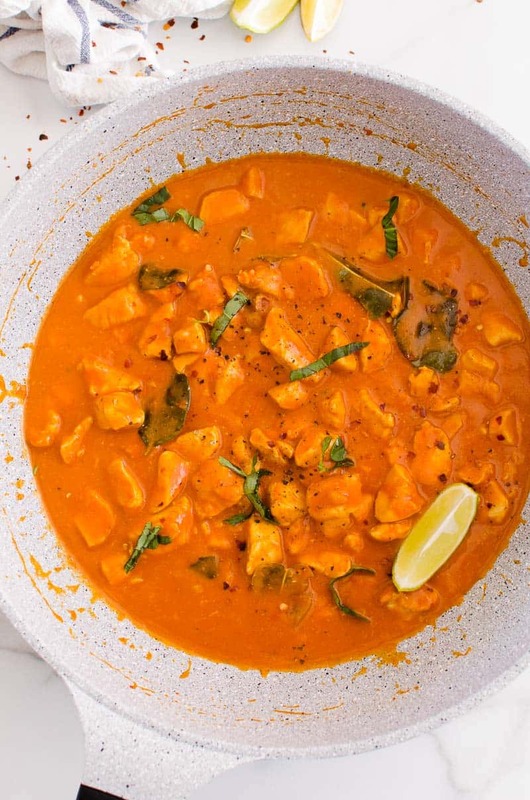 Mild-medium curry aka kid friendly but still with a kick – 2 tbsp (I usually add this much). Spicy curry – 4 tbsp. Tip: Substitute with yellow or green curry paste if that’s what you have on hand. No need to drive to the store. Saute garlic and ginger for 30 seconds stirring constantly. It burns fast. Add cubed chicken and cook for 5 minutes. Doesn’t have to be cooked through. Add coconut milk, curry paste, tomato paste, maple syrup, kaffir lime leaves (if using), salt and pepper and cook uncovered for 15 minutes. 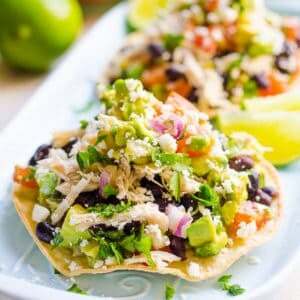 Garnish with fresh basil or cilantro, a bit of lime juice and serve over brown rice. OMG, just look at this 25 minute Thai coconut chicken curry! Who needs takeout?! Chicken curry with coconut milk bulked up with lots of cauliflower for a 30 minute dinner! Thai shrimp curry with butternut squash – another mind blowing quick dinner with tons of veggies. Eggplant vindaloo curry – vegan and meatless curry even carnivores will enjoy. 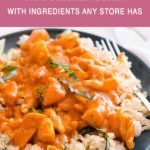 Instant Pot butter chicken approved as “authentic” by many-many readers! 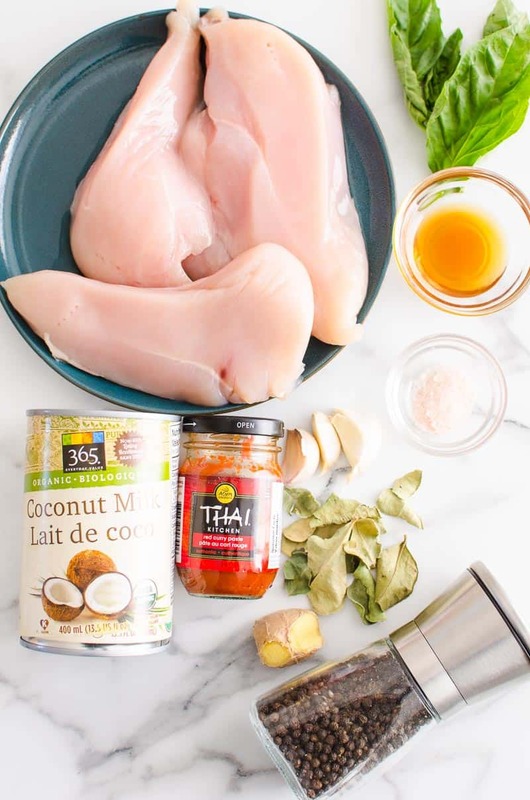 Make authentic Thai coconut chicken curry in 30 minutes with simple ingredients from any grocery store. Preheat large deep skillet or wok on medium heat and swirl oil to coat. Add garlic and ginger and saute for 30 seconds, stirring constantly. It burns fast. Add chicken sprinkled with a pinch of salt, and cook for 5 minutes, stirring occasionally. Doesn’t have to be cooked through. Add coconut milk, curry paste, tomato paste, maple syrup, kaffir lime leaves (if using), salt and pepper. Reduce heat to low and cook uncovered for 15 minutes. 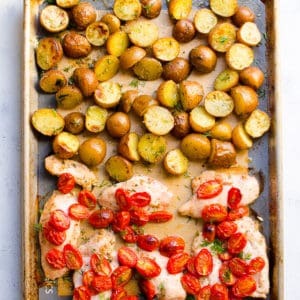 Storage Instructions: Refrigerate in an airtight container for 2-3 days or freeze leftovers for up to 3 months. 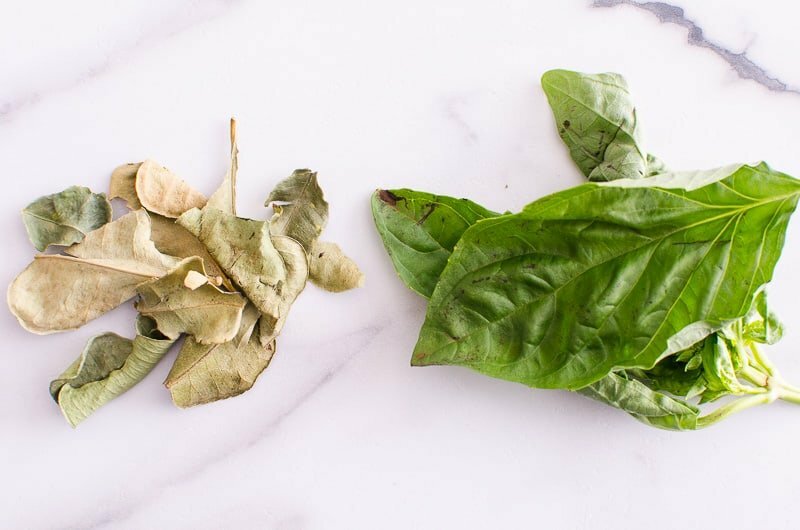 If you don’t use kaffir lime leaves, add fresh basil leaves at the end. 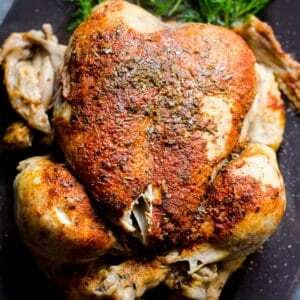 I made this recipe for my family last night…WE LOVED IT! I doubled the batch so we would have leftovers for lunch but I ended up Turing the leftovers into soup for dinner tonight. This has been a huge hit – Thank you. Will definitely make again. ** for soup, I sautéed onion, celery, fennel, carrots in olive oil. Diced potato, turnip, rutabaga (I know sounds weird but worked); then added 4 C chicken broth. Cooked the veg in simmering broth then added left over Thai Chicken Curry. Added a knob of ginger, 1 t of curry paste to bump of flavor and left over brown rice. So good! So happy to hear, Jill! You are smarter than me because you doubled the recipe. We had no leftovers. And your soup sounds amazing and something I would totally do! Olena, I love all your recipes. Thankyou! And this one was super quick and delicious… Definitely making it again. Yay! 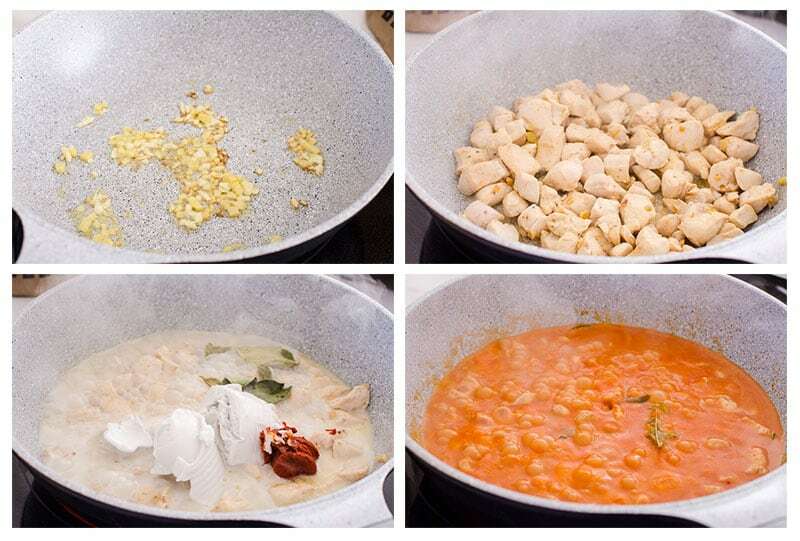 So happy to hear you loved my Ukrainian Thai chicken curry, Simone! SO do you mean you have an Instant Pot too? LOL Cause I post a lot of those recipes. I’m still obsessed with mine years later.